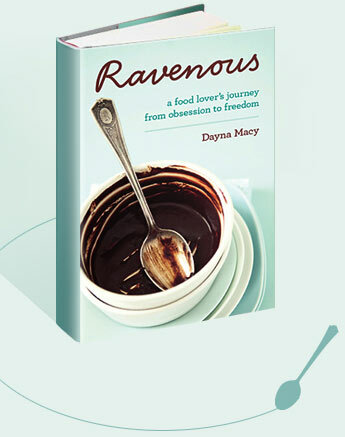 Praise — Dayna Macy, author of "Ravenous"
This rich, compelling book follows a woman’s search for balance, and ultimately, freedom, in her relationship to food. Macy’s writing is strong and beautiful, every page filled with risk and integrity. I truly loved Ravenous. It’s a real accomplishment. Food as protection, comfort, pleasure and love, a defense against deprivation, a buffer against pain — so many of us will recognize our insatiable hungers in Dayna Macy’s quest to understand her own. But the real appeal of Ravenous is Macy’s voice: her candor and humility, her curious mind and storyteller’s clarity, and the open, generous heart she brings to her tale of learning to find peace with her appetite and her body. Ravenous is the journey of a courageous, smart, beautiful woman who learned that there is no final answer — but that the inquiry itself, the work of being and growing and accepting, is the salve that heals the heart. Macy’s writing is the perfect blend of humor, irony, and wit. Her warmth and earnestness is so lovable that I found myself rooting for her all along. I couldn’t put it down! Ravenous is among the most engaging, fun and insightful books about appetite you’ll ever read. A wonderful melange of memoir (what a family! ), recipes (you can taste them), the journalistic exploration of the art of food production (slow, local, artisanal, organic) topped off by uncommonly delicious writing.